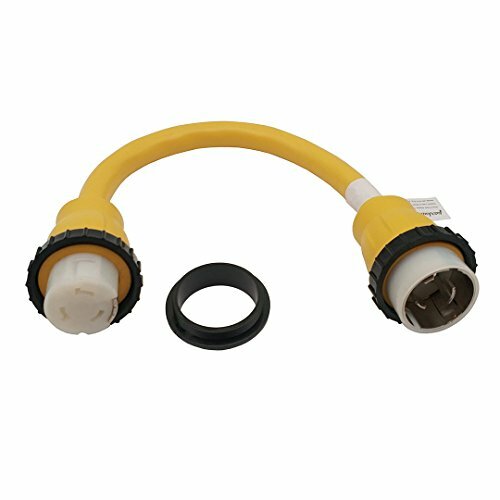 If you need to connect your shore power 125V/250V 50A extension cord (with SS1-50 plug) into 125V 50A power inlet on pedestal(for SS2-50 locking with seal ring type) to get power. This power adapter cord can help you to solve your requirement.. Shore power 3-prong 125V twist lock SS1-50P male plug with locking ring . Marine Shore power SS2-50R female 125V/250V socket with locking ring and seal ring (collar). Heavy-duty power adapter cord for Yacht / Marine / Recreational Vehicle camping. 100% copper wire conductor inside, Use 6 AWG copper inner wire, support max 50 Amp overload.